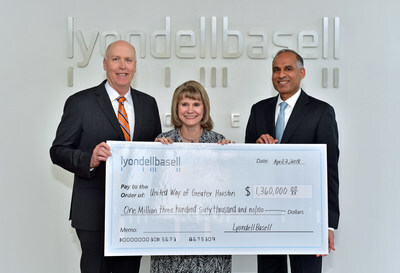 HOUSTON, April 3, 2018 /PRNewswire/ -- For the 29th consecutive year, LyondellBasell, one of the world's largest plastics, chemical and refining companies, is a top corporate donor to the United Way of Greater Houston with a donation of $1.36 million for its 2017 campaign. As part of the company's commitment to be a responsible, good neighbor in the communities where it operates, LyondellBasell held United Way campaigns at 23 company sites across the United States and raised a total of $2.3 million. "The work United Way does in our communities is far reaching and makes a lasting impact to those most in need," said Bob Patel, LyondellBasell CEO. "Once again, I am humbled by the generosity of our employees across the U.S. who contributed during the company's annual United Way campaign to help improve lives in their communities. They truly exemplify our company's mission to be a good neighbor through their volunteerism and financial contributions." According to the United Way of Greater Houston, one in three families in the region live on an annual income of $40,000 or less, 45 percent of senior citizens struggle to meet everyday expenses, and one in five students does not graduate from high school. And the number of families and elderly in need has grown significantly since Hurricane Harvey devastated the Houston area last August. "United Way of Greater Houston helped nearly 2 million of our neighbors build better lives because of dedicated community and corporate partners like LyondellBasell. We are extremely thankful for their support," said Anna M. Babin, United Way of Greater Houston president and CEO. "We are facing one of the most challenging chapters in our city's history given the devastation left by Hurricane Harvey and we are grateful to LyondellBasell for continuing their commitment to the United Way while also supporting their employees and thousands of others affected by the storm," said Neil Duffin, 2017-18 United Way Community Campaign Chair and President of ExxonMobil Production Company. Career and Recovery Resources, Inc. – With a mission to help people overcome barriers, this organization works to prevent veteran homelessness, provide career planning for at-risk youth, place senior citizens in the job market, and provide job-readiness training for the deaf and hard of hearing. Fort Bend Seniors – As one of the oldest non-profit organizations in Fort Bend County, Fort Bend Seniors is committed to helping seniors remain independent by enhancing their quality of life through comprehensive services and programs such as Meals on Wheels, transportation, case management, health screenings, and recreational activities. Target Hunger – This grassroots, community based program fights hunger in Houston's inner city neighborhoods through food pantries, a network of volunteers who help deliver groceries to seniors citizens, and community gardens that give volunteers and clients the opportunity to grow nutritious produce to benefit themselves, their neighbors, and Target Hunger food pantries. Wesley Community Center – Founded in 1904 to serve widows and orphans living in poverty, this agency now provides an array of programs to strengthen families and create opportunities for economic stability including childhood education, workforce programs, and affordable transportation, housing, and food assistance.